Rich Chocolate Creme Patissiere Pastry Cream, perfectly creamy custard with intense chocolate flavor! Ideal for an array of desserts or even piped into glasses and topped with fresh vanilla whipped cream and berries. Plus, it’s super easy to whip up a batch! 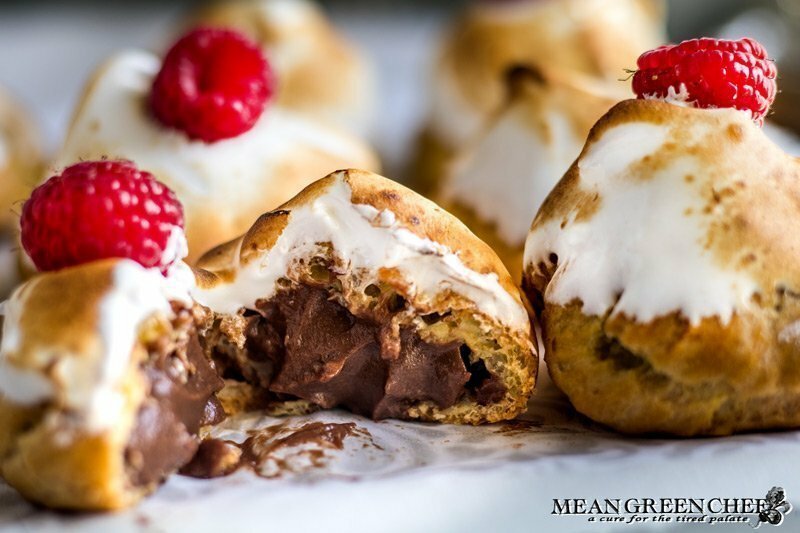 Here we’ve piped chocolate pastry cream into Paté a Choux Pastry, dipped into French Meringue and then torched them to toast the tops, creating a lovely Hot Cocoa Cream Puff! What can you do with pastry cream? Pastry Cream or crème patissière is a delicious, thick stirred custard, cooked on the stove, and made from a mixture of cream or milk, eggs, sugar, and cornstarch or flour. It originates in France and is a staple in pastry kitchens throughout. Used to fill Napoléons, profiteroles (cream puffs), eclairs, tarts, donuts, or even eaten plain like a pudding. Often times spread between layers of fluffy cake its uses are endless in dessert creation. Chef’s Tip: Don’t skip tempering the eggs, if you pour your egg mixture straight into hot liquid you may end up with small bits of scrambled eggs in your pastry cream. We don’t want that, but don’t worry about this step, while crucial it’s really easy to master, I promise! To avoid this, you temper your eggs by pouring a small amount of the hot milk and vanilla into the egg mixture while whisking vigorously. Then immediately pour the tempered mixture back into the milk and vanilla while whisking vigorously. Prep for this so you can work quickly. Place your mixing bowl with the egg mixture near your saucepan and have everything ready to go. Why do you need cornstarch or flour in pastry cream? Food Nerd Alert: In order for the pastry cream to thicken, it needs to be boiled just long enough for the egg’s proteins to join as tightly as possible without curdling. Cornstarch (or flour) blocks the proteins from each other, allowing the eggs to heat longer and at a higher temperature for optimal thickening. Plus, starch adds a bit of its own thickening power too. How long can I keep pastry cream in the refrigerator? Press a piece of plastic wrap against the surface of the pastry cream and refrigerate until you’re ready to use it. Pastry cream will keep for 5 days in the fridge. Do not freeze, as the custard splits and will never be a perfect consistency after freezing. This makes 8 cups of Pastry Cream, halve the recipe if you don’t need as much! A rich Chocolate Creme Patissiere Pastry Cream, perfectly creamy custard with intense chocolate flavor! Ideal for an array of desserts or even piped into glasses and topped with fresh vanilla whipped cream and berries. Pour the milk and vanilla into a large heavy-bottomed saucepan over medium-high heat and bring to a boil. While the milk and vanilla are being heated, add the sugar, eggs, egg yolks, cornstarch, cocoa powder, and salt into a bowl. Whisk until you have a thick, smooth mixture. Set aside until the milk and vanilla come to a boil. Once the mixture starts to boil, remove it from the heat. Slowly pour about 1/2 of the hot milk in a thin stream into the egg mix, while whisking constantly to temper the egg mixture. When the eggs have been tempered add the egg mix back into the hot milk in the saucepan. Heat the custard over medium heat while whisking vigorously until it starts to thicken about 3-5 minutes depending on the heat level. Let the custard come to a gentle boil and release some bubbles, as soon as this happens remove from the heat and add the bittersweet chocolate chips. Whisk until completely melted. If you need to slide the saucepan back over low heat to finish melting you can do so. Once the chocolate is melted, add the butter and whisk until it's completely melted into the custard. Immediately pour the pastry cream into a bowl and cover the surface with plastic wrap to prevent a skin from forming on the top. Allow it to cool off and come to room temperature and then chill in the fridge at least 4 hours or overnight. After chilled (stir if needed) and use liberally! Store Chocolate Pastry Cream with plastic wrap to seal the top for 5 days in the fridge. This makes 8 cups of Pastry Cream, halve the recipe if you don't need as much! If you want to make chocolate filled cream puffs then use our Paté Choux Recipe. 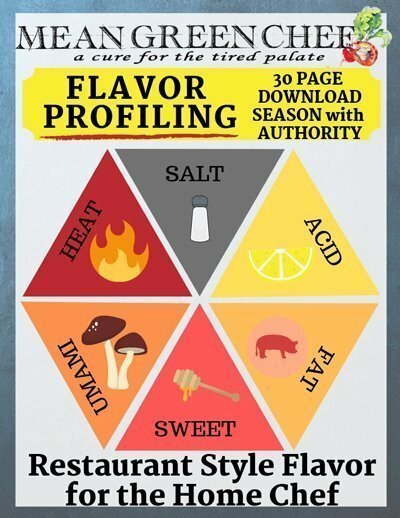 Love unique recipe ideas? Then you may also like our Pear & Almond Tart!